Our WOMEN’S VITALITY probiotic supplement combines the power of probiotic cultures plus women’s urogenital health-focused ingredients to support urinary health and vaginal flora balance. Probiotics help improve absorption of these critical women’s health ingredients. Poor diet, pollutants, and antibiotics can all wreak havoc in our gut. Probiotics provide the good bacteria that regulate your inner ecosystem to promote health from the inside out. WOMEN’S VITALITY PROBIOTIC supports healthy digestion, immune system health, and vitality. 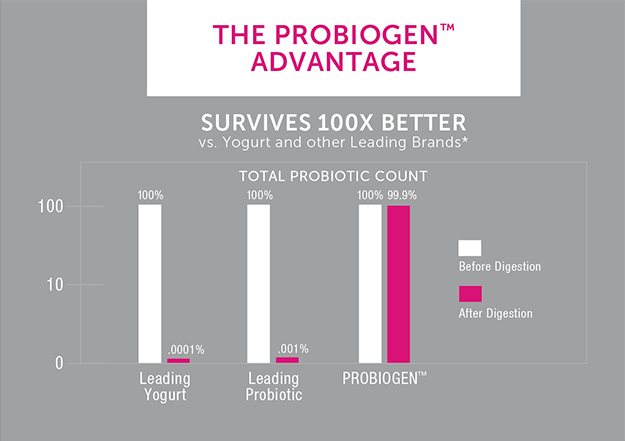 Feel the Probiogen™ difference! • Cranberry contains proanthocyanidins, which is an antioxidant that may help decrease bacterial adherence to the bladder epithelium cells. This action may help lessen the possibility of bladder and urinary tract infections. • DDS-1 is a probiotic proven to be a potent strain for urinary health and balanced vaginal flora. • Caprylic Acid is a fatty acid with natural antibacterial and the ability to support healthy inflammatory responses. Caprylic acid supports reproductive and digestive health. Lactobacillus Rhmanosus DDS-1: A potent strain for urinary tract health and balanced vaginal flora. Contains NO: GMO, dairy, wheat, gluten, sugar, soy, artificial colors or flavors, binders, fillers or flow agents. Suggested Use: Take two (2) capsules daily after a meal or as directed by your physician. No refrigeration needed.